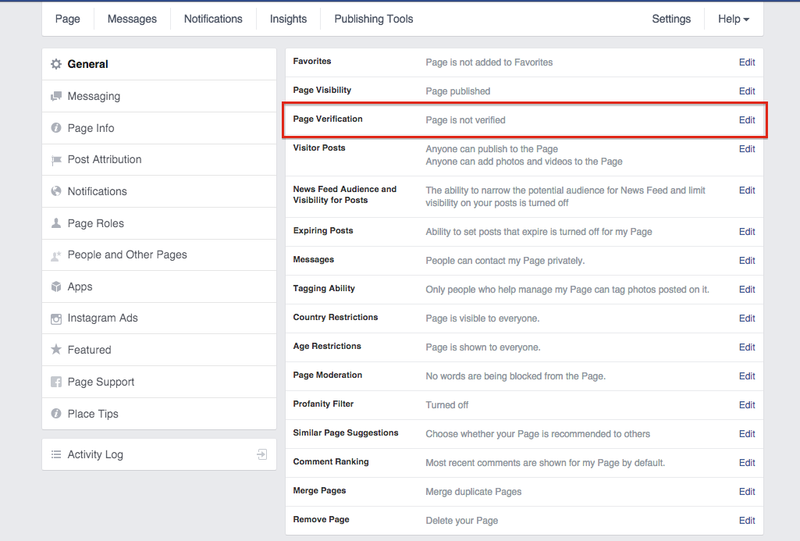 In October of 2015, Facebook rolled out the ability for owners and administrators to verify Facebook business pages. Why is this important for your small business? According to Facebook, verified business pages show up higher in search results to potentially attract more visitors and customers. Verified Facebook business pages also receive a small checkmark next to their profile image and business name within their cover photo. The checkmark ensures visitors that the page is the official, authentic page of your business and that the content can be trusted to be accurate. And, as if that weren’t enough … Facebook has announced that verified business pages will be the first to receive access to new features to help promote your page and attract more visitors. So, how do you verify Facebook business pages? Log in to Facebook as one of the administrators of your business’ page and then click the Settings button in the top right. On the next screen, find the Page Verification section (third from the top on the right) and click the Edit button. A popup will then appear to tell you some of the benefits of verifying your small business page. Click Get Started. Another popup will then appear instructing you to enter a phone number. The phone number displayed on your business’ Facebook page should appear in the dropdown. If it doesn’t or if you want to change the phone number that does appear, update it within the Business Phone Number field. Once the correct phone number is entered, click Call Me Now. Once again, a popup will appear instructing you to enter a 4-digit verification code that Facebook will communicate to you during their phone call to the phone number you provided. Enter the verification code and click Continue. If you don’t answer the original phone call for Facebook or enter the code incorrectly, click Call Me Again and repeat the process. Next, a notification from Facebook will appear to inform you that they are reviewing your submission to confirm the accuracy of the request. Once the request is approved, Facebook will notify you via email. Click OK.
You should receive the email from Facebook almost immediately after submitting the verification code, however Facebook does suggest it could be a few days before the email arrives. Once you receive the email from Facebook, the process of verifying your business is complete. You should then see the checkmark next to your business’ name on your Facebook page. For help verifying your business on Facebook or other social media outlets and local directories, contact KMB Local Marketing at info@kmblocal.com or check out our website for the full range of digital marketing services we offer.